This fall, ATP will expand upon its current 31 flight training centers, with the introduction of five new locations. Opening in September, students in the Dallas and Houston metro areas will have the added convenience of new training centers in McKinney, TX and Southwest Houston, respectively. Scheduled to open that same month is the St. Louis training center. Coming in October, the pacific northwest will be greeted with flight training centers in Portland and Seattle. Supporting this growing expansion is a three-year fleet purchase deal for up to 100 factory-new Piper Archer TXs, announced at the 2013 SUN 'n FUN International Fly In and Expo. With a firm order for 25 aircraft and the option for another 75, these new Pipers will feature Garmin G500 glass cockpit avionics suites. All of the new locations will offer multi-engine add-on rating programs, as well as ATP's Airline Career Pilot Program. Providing airline-oriented flight training at a fixed cost in the shortest time frame, the Airline Career Pilot Program offers students a career track, from zero time to 1500 hours, sponsored by ATP's airline alliances. In 1984, ATP pioneered accelerated, professional multi-engine flight training with an emphasis on pilot career development. Today ATP's Airline Career Pilot Program prepares pilots for airline careers with nationwide flying experience in multi-engine aircraft. In partnership with the leading regional and national airlines, ATP offers its students an airline-sponsored career track from zero time to 1500 hours, with CFI job placement and airline employment. 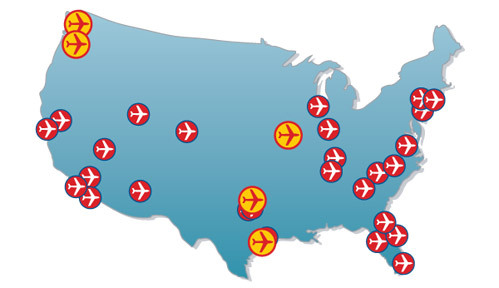 ATP flies over 9,000 hours to provide more than 350 FAA pilot certificates every month across 36 locations nationwide. As America's largest flight school, ATP provides more pilots to the regional airlines than any other single flight school, college, or academy.